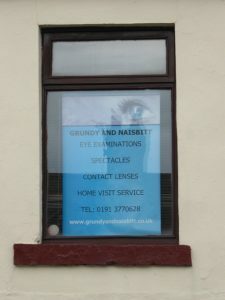 Located inside M. Whitfield pharmacy, Grundy and Naisbitt Ltd. have been providing eye care to Coxhoe residents for forty years. They offer eye examinations, spectacle dispensing and contact lens fitting. The company’s ethos is to provide a personal service, with comprehensive eye examinations including digital retinal photography. Many of their patients qualify for free NHS eye examinations. The opticians examine patients of all ages. You will see the same practitioner at every visit. They also offer a home visit service for housebound patients throughout County Durham.